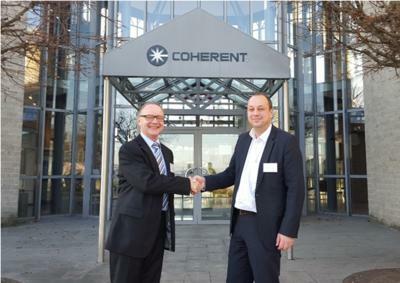 Coherent, Inc. (Santa Clara, CA) (Nasdaq: COHR) has opened a new CO2 laser applications laboratory in Beijing, China. This facility will give customers in the rapidly growing Chinese materials processing and microelectronics markets the ability to get quick feedback on the suitability of their specific application for CO2 laser processing. The Coherent Beijing applications laboratory is currently able to process a wide variety of laser/material interactions with up to 400 watts of laser power. As we add higher power levels such as 1 kW from our new DIAMOND E-1000, we'll be able to address an even broader selection of applications. "The introduction of more compact CO2 lasers with greater reliability and lower cost of ownership, such as our DIAMOND E Series, have helped fuel a substantial expansion in applications for these sources," notes Sri Venkat, VP/GM CO2 Business Unit, at Coherent. "Beyond traditional materials processing applications, we're now seeing increased demand for sealed CO2 lasers for a variety of new applications and materials. Having the ability to perform testing locally will speed development and adoption of these new processes in China." Founded in 1966, Coherent, Inc. is a Russell 2000 Index company and a world leader in providing laserbased solutions to the commercial and scientific research markets. Please direct any questions to Sri Venkat, VP/GM CO2 Business Unit, at (860) 769-3155. 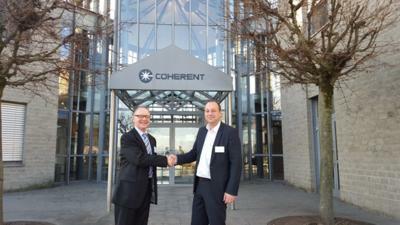 For more information about Coherent, including product and financial updates, visit our website at http://www.Coherent.com.